Students and teacher at Peyton High School. COLORADO SPRINGS, Colo. — The Peyton Advanced AutoWoods Cabinet 6 class installed cabinets into the main foyer at the MiLL training center. These students have been measuring, creating, and making all the necessary adjustments all semester to make sure their cabinets are just right. Installation of the cabinets serves as the final exam for the class and gauge how much they learned throughout the semester. 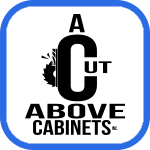 The students that were present to assemble the cabinets were high school graduating senior Bekah Davis, junior year students Chase Miller, Treyston Whaley, Isaac Hermes, Chandon Harris, and lastly sophomore Haylie Peterson. Under the guidance of their instructor, Peyton AutoWoods teacher Chet Miller, they were able to successfully install all the cabinets. Students made cabinets for the main foyer at the MiLL training center. These students have come a long way since their last project for the foyer. In January 2017, the class installed a grand desk for the MiLL. It was the first manufacturing project to be placed at the MiLL that the students themselves created. See https://themillco.org/ for more information.